Competition in the social task/project-management market is heating up. Facebook co-founder Dustin Moskovitz’s startup Asana and Salesforce.com’s Do.com are some of the most visible players (see my previous coverage), but they’re not the only ones. Case in point: Producteev, which just added some new collaboration features via a partnership with Crocodoc. Producteev was launched at Le Web in 2008. Since then it’s raised $1.31 million in funding and just passed the 2,000 paying-customers milestone. Among those customers are Apple, Disney, and the Financial Times. It’s free for individuals, and group plans range from $20 to $500. In addition to the web version, there are clients for iOS, Android, OSX, and Windows. It’s not the most exciting app out there, but it has an extensive set of features, including an integration with TaskRabbit so that you can outsource your tasks. The Crocodoc functionality makes it possible for users to annotate and comment on attached documents from within Producteev. It’s a pretty straightforward addition. 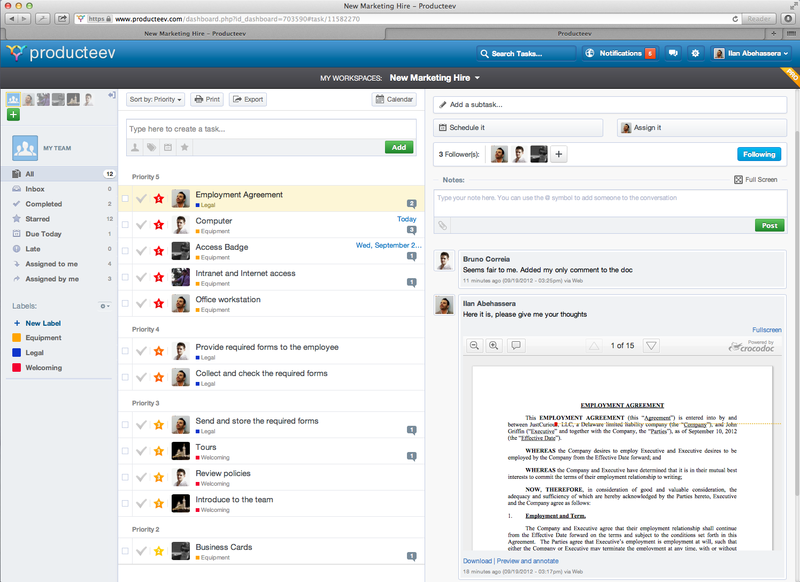 The question is whether it will make the most sense to collaborate on documents in a task-management app like Producteev, or if it will make more sense to do so in a more document-centric context like SharePoint, Box, or Google Docs. The real idea long term is to bring everything a bit closer together. Producteev is off to an awkward start in that regard. One limitation is that, although Producteev used to integrate with Google Calendar and Google Tasks, it no longer does due to changes in the APIs for those products. CEO Ilan Abehassera says the company is working to resolve this. Also, its Outlook plugin, which is more important to the enterprise, is no longer supported though a new version of that is being promised as well.